My office is in our fully finished barn loft. While it’s finished, it still gets super hot and muggy up there and costs a fortune to keep cool if I crank the air conditioning. The windows don’t open, so the need for a top quality fan is strong. I received one of these Lasko Tower Fans, and every part of my being is functioning better. My brain, lungs, and soul are rejoicing. This post was sponsored by Lasko. All opinions expressed in my post are my own. Check Out All the Lasko Fans Here! Being at a comfortable temperature is imperative for productivity. I don’t operate well under either extreme, but at least in the winter months, I can just wear as many layers of clothing, blankets, and heated things as needed. When it’s a sauna outside–and in–you can only take off so many clothes. While I’m in my office, I have my Lasko Tower Fan set up right by my workspace. I turn on the fresh air ionizer, so I’m not just at a homeostatic temperature, but I’m also not breathing in so much dust and pollen. Since I’m not setting the thermostat to 49 degrees–seriously have to put it low to get the air upstairs–we’re saving a ton of money and energy. It’s the simplest thing. This fan circulates the air just enough to cool off the loft space without adjusting the thermostat. 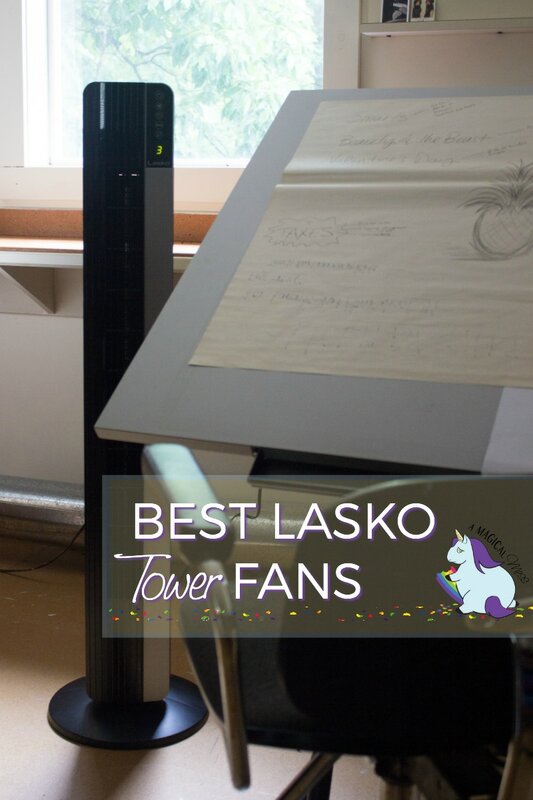 There are several Lasko Tower Fans to chose from, but I’ve got the 48″ Performance 3-Speed Tower Fan. It’s lightweight and easy to move from room to room. When I’m not working my brain, I move it downstairs for our workouts. Lately, the Boop has been my workout buddy, and OMG this kid knows how to break a sweat. Keeping up with a fifteen-year-old athlete is no joke. We positioned the fan in the center of the room and turned on the oscillating feature. Even if we’re mid-plank, we can adjust the settings with the handy remote. 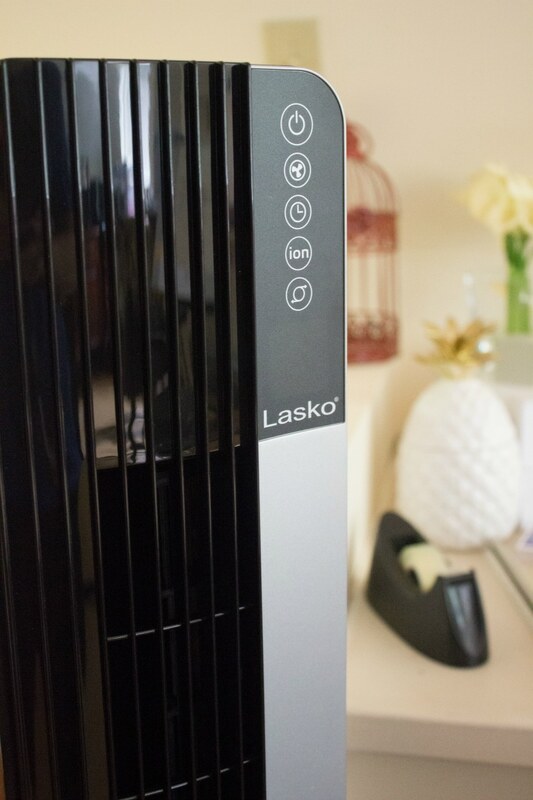 With back-to-school season swiftly approaching, Lasko Tower Fans are an ideal solution to stinky dorm room bogs. Know anyone going back to college? Send them on their way with brain-flow-inducing-air-flow! Lasko Tower Fans are high quality and inexpensive. Get yours here. Since we discovered Lasko that is the only fan brand we use. Powerful, and quality made too. I could use a fan like this. Need to breathe better air. Aren’t they THE best?! They are really helpful for us in Florida. We put them on the second floor to help cool off! I have 2 tower fans! I could never go back to regular old box fans! Tower fans are amazing! I need one of these for my office. It gets hot in there, and this tower fan could really help me keep cool. I love that it’s also an ionized air purifier. That’s awesome. my family and I have different temp requirements. Fans like this come in handy around here. I was 100 degrees yesterday I really wanted a fan. THis Lasko fan sounds like a great fan to use and the remote makes it easy to use too. Lasko Tower Fans are attractive and useful. I need this in my office.